This picture brought back the memory of when I first got married, some 37 years ago. 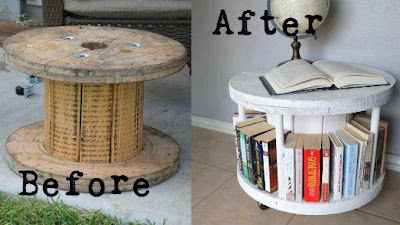 We furnished our first apartment with these spool tables. I remember we covered them in red and black fur, of all things. And we stapled a strand of little red furry balls around the top edge. Put a spool on each end of our sofa, which was covered in fake black leather and red fur. Oh my god! We were just starting out and we got the spools for free. I have an ex-boyfriend who used to have a table from one of these. Only he did not do anything to change it, lol. I do like the way they changed this and made it a little book shelf. You can never have too many books or places to put them, lol. have to remember is the keyboard recorder which is the real diligent. should protect their computer from viruses, and from spyware and malware infections.